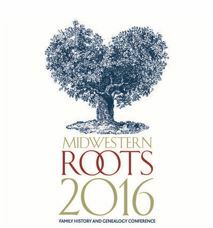 The Midwestern Roots Family History and Genealogy Conference will be held July 15-16, 2016 at the Indianapolis Marriott East. Preconference events take place on July 14. You won’t want to miss this event hosted by the Indiana Historical Society! This year’s conference is appropriately themed, #YourStory. The conference is excited to host Jennifer Alford, Jen Baldwin, Lisa Louise Cooke, CeCe Moore, Juliana Szucs, Curt B. Witcher and many more distinguished national, regional, and local speakers! The opening session on Friday by Curt B. Witcher, Your Story, Our History: The Power and Value of Story, will surely have attendees excited about our place in state and national history. Pre-conference activities include a variety of workshops offered in addition to research opportunities at any number of local genealogical research facilities including county libraries, area museums, and national organizations. Look for a complete list of facilities on the conference website. The conference will host more than 30 sessions, many of which will spotlight online resources and changing and emerging technologies that are impacting the way genealogists research their family history. In addition, there will be sessions discussing legal genealogy, DNA, the use of Evernote in genealogy, African-American genealogy, finding female ancestors, how to work your own “genealogical cold case,” “metes and bounds surveys,” treasures at the National Archives, and genealogy and GIS, just to name a few. Once again, the conference will host the Family History Market and Book Fair, allowing ample time in the schedule to peruse the resources from national, regional, and local history exhibitors in the Exhibit Hall. Whether your time permits attendance for all three days or just a portion of the conference, you will find a registration option to suit your needs. Librarians may earn continuing education credits from this conference. To learn more and to register visit indianahistory.org/midwesternroots or call (317) 232-1882. Register before June 30, 2016 for early registration prices! Follow @IndianaHistory on Twitter and stay up-to-date on Midwestern Roots with the hashtags #MWR16 and #YourStory. This entry was posted in Genealogy by indianastatelibrary. Bookmark the permalink.